What seems to be one of those tourism slogans (by the way, it is the official slogan of Papua New Guinea tourism) is actually true: from wallabies dropping in at dinner time, barking parrots or the Royal Australian Airforce paying a visit  you can have it all in PNG. When I first started planning my trip to Papua New Guinea, a decision had to be made whether to go on a liveaboard or stay landbased. I really love liveaboard diving but Im very fond of having some sand between my toes in between dives as well. To get a good cross section of this vast country (more than 470,000 square kilometres) I decided to visit two very different resorts in two remote areas: one on mainland PNG and one on New Ireland  an island on the far North-Eastern border of PNG. Lissenung Island close to New Ireland was the first part of the trip. Arriving at Kavieng Airport, after a 3 hour scenic flight via Rabaul and its surrounding active volcanoes, it is only a 5 minutes drive to the harbour and a 20 minutes speedboat ride to reach the tiny island of Lissenung which means a place of rest in the local language. Lissenung is a dedicated dive resort catering for only 14 people in 7 traditional bungalows built on stilts around the island. The rooms are equipped with mosquito nets, fans and solar heated showers and have a nice veranda facing the ocean. Meals are served in the main building which is the restaurant, kitchen, lounge and library. Most food is bought from the surrounding villages and the local market, so youll find a lot of fresh fish, crabs, lobster and vegetables on the menu. The islands location is quite unique  it is part of an island chain between the South Pacific in the North and the Bismarck Sea in the South. 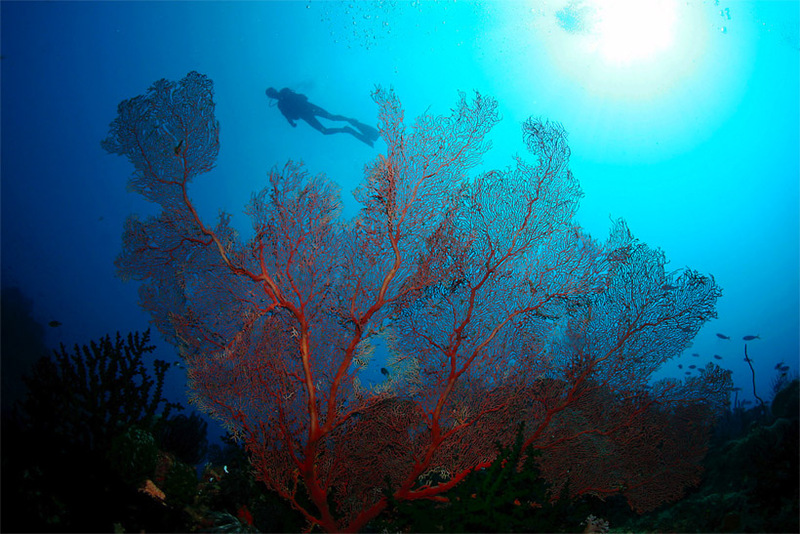 Between the islands there are several channels and sea mounts promising excellent dives. Since Kavieng was at the frontline during Word War II, there are a couple of interesting wrecks in the area: reconnaissance planes, Japanese and US bombers as well as ships and boats, some still not identified. And some not even been found yet. The most impressive wreck which has been discovered only in 2003 is called Deep Pete - a Mitsubishi Bomber lying upside down in 40 m, still in a very good condition and covered with colourful corals. Visibility is rarely below 30 m, and the plane is surrounded by a resident batfish school, snappers and  fittingly  soldierfish. Barracudas and trevallies often stop by and a huge turtle seemingly likes to rest near the plane. New Ireland is known for big fish and fish schools; they are best observed on the outer reefs and channels. Two dives not to be missed are Albatross Passage and Planet Channel. On an incoming tide and running current grey and whitetip reef sharks, barracudas, trevallies, maori wrasses and Spanish mackerels are almost guaranteed as well as different species of fusiliers, big dogtooth tunas or wahoos. If you are lucky, the resident school of eagle rays might also fly by. 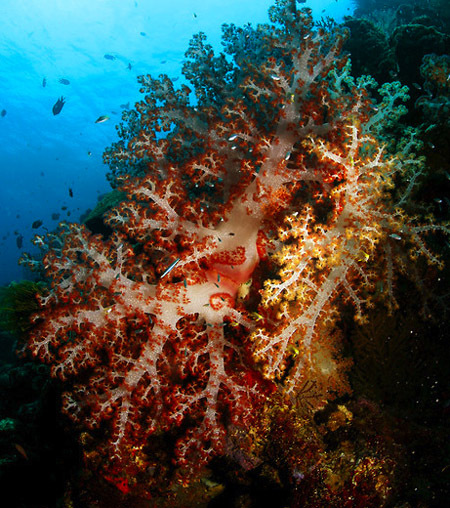 If visibility is lower or the current is not running, have a closer look into the reef and go for the critters  for example ghost pipefish, lobsters, pygmy seahorses or the endemic Bennets Clownfish. 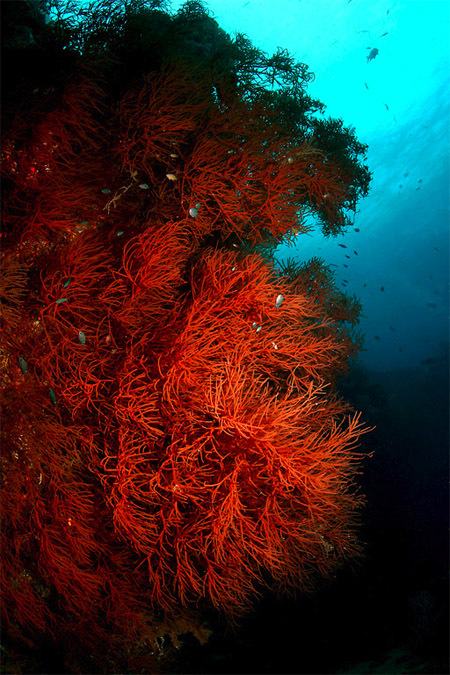 Everytime, the reefs boast with pristine hard corals, colourful sea fans, soft and whip corals. Although the big creatures and the reefs are in the spotlight, muck diving is available as well and nice for a change. The Bottleshop is located in Kavieng harbour, just below the Pier and got its name from all the bottles thrown overboard and dumped there. 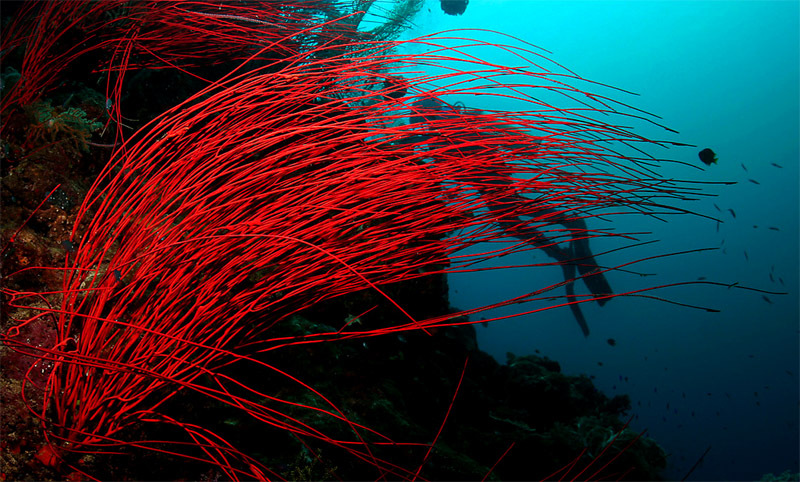 Now they and lots of other rubbish are home for critters like gobies, blennies, puffers, cardinalfish, small groupers and pipefish, whereas Demon stingers, lionfish and sea snakes roam the open area. 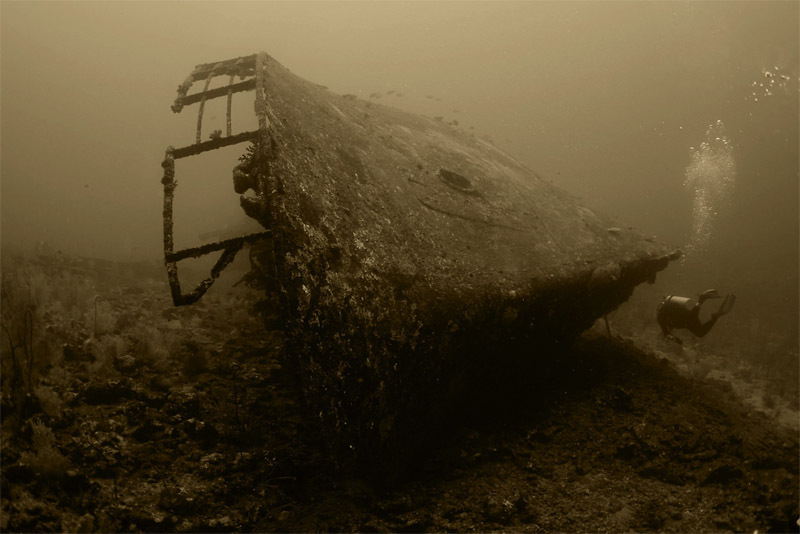 Boat dives are normally done as two-tank dives to be able to dive the reefs further away and a second spot on the way back. Late lunch will be served after the second dive when you get back on the island. If you dont want to return to the boat for the afternoon dive, you can also dive the house reef free of charge any time during the day. It is quite shallow but features some nice corals and a lot of different fish species as well as octopus, squids and nudibranchs. It is also an interesting night dive. If you look for some above water experiences, several tours can be arranged  a visit to the local market, surrounding villages or to mainland New Ireland for a trip along the scenic Boluminsky Highway. 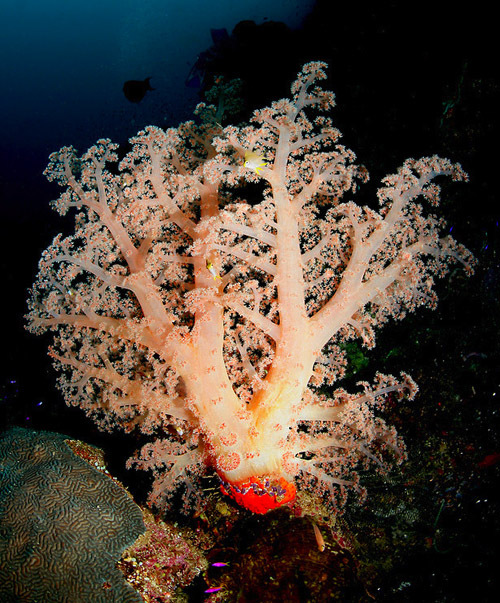 For experienced and adventurous divers, Dietmar and Ange, the owners of Lissenung Resort organize exploratory dive tours once or twice a year. The trips are done around New Ireland and especially New Hanover. Divers will stay in basic guest houses in the area eating meals provided by the locals with what is currently available and discover a new dive site or two. This could well be the ultimate experience in the land of the unexpected! GETTING TO LISSENUNG: via Port Moresby (capital of PNG) to Kavieng. Qantas and Air Niugini fly to Port Moresby, Air Niugini to Kavieng. You will be picked up at the airport. THINGS TO DO: snorkelling, swimming, sailing, fishing, kayaking, visiting neighbouring islands and villages, Kavieng market, or have the resort organise a tour to New Ireland or combos with trekking and culture. 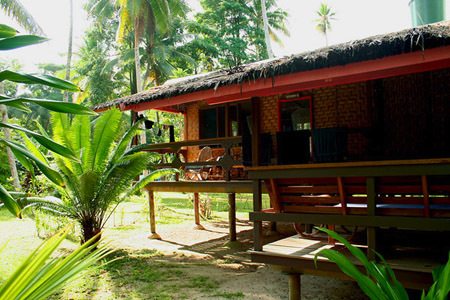 LISSENUNG ISLAND: prides itself to be an acknowledged eco resort. As an PADI Go Eco operator the resort is committed to minimise divers impact on the ecosystem and contribute to environmental, economic and cultural conservation.